A lot of them I will repurchase in the future (or I already have hehe), but others I am sure I can live without. 1. Urban Decay De-Slick Makeup Setting Spray - I tried this version of the UD Setting Sprays after I tried the original Stay All Night Spray (which I talked about here) and wasn't too impressed with considering the price. I can definitely say that I like (okay... LOVE) this version so much more. I can get incredibly oily skin throughout the day and a find that using this spray after make-up application not only helps my make-up stay in place but also keeps oiliness at bay - who can say no to that? 2. Clinique Anti-Blemish Solutions Foundation - I have been using this foundation for quite some years, I am actually about to finish my second bottle. I first mentioned this foundation on my blog in this post - I loved it then and I still love it now. I have read some reviews were people are quite divided on it but for me it is definitely a great long lasting day to day foundation especially for my skin type. It has a medium to full coverage that still looks very natural and goes on quite matte. But what I like most about it is that it doesn't exaggerate blemishes and actually covers them up quite well. Big tick from me! 3. Clarins Beauty Flash Balm - Now this a product I feel is quite raved about and I probably bought it because someone mentioned that it was fabulous. Don't get me wrong, it is a lovely product. I used it as a primer and on it's own on no make-up days and it would leave my skin feeling incredibly hydrated and somewhat more luminous. But for the price tag (I think it retails for about $60 AUD) I don't think it is a product that I really need. Great to have yes but probably not necessary. 4. Soft and Gentle Mineralize Skin Finish - It was most definitely a sad day when this finished. I bought it during my trip to the US in January so you could say I loved it so much it didn't even last me a full year ... (*cries*). I would put this up there as one of my favourite highlighters of all time (spoiler alert: top 5 highlighters post coming soon tho) so I won't go on about it too much but damn this made your cheek bones pop! It gave the skin such a lovely healthy glow I am not sure if my other highlighters compare ... but more trialing to be done there. 5. First Aid Beauty Facial Radiance Pads - If you love chemical exfoliators then this baby is definitely for you. This for me is definitely a staple product as it not only exfoliates the skin but also tones and brightens but is gentle at the same time. Full of AHA's and BHA's - and my favourite skincare ingredient Glycolic acid, it is great for blemish prone skin and for keeping skin smooth. 6. La Roche-Posay Effaclar Purifying Foaming Gel for Oily and Sensitive Skin - I am a bit on the fence with this one. It is a great foaming gel but it is not fantastic. I feel like it does the job in the sense that it cleanses the skin without stripping it completely but I am not overly in love with it. I have really yet to find a great cleanser for my skin type so I am constantly switching between brands and types. So suggestions would be appreciated! 7. Dermalogica Daily Microfoliant -sample size - I wasn't on the market for a manual skin exfoliateor when I tried this but it is such a great gentle exfoliant that you can use daily. Straight after using it you can feel that your skin is much more smoother and brighter. I really feel that it refines the skin and leaves pores clear and less noticeable. I used this in rotation with more heavy duty manual exfoliator (more on that one later) especially during that 'special' time of the month. It is well worth the price in my eyes. 8. Maxfactor False Lash Effect Mascara in Black - I have tried many drug store mascaras but I constantly come back to this one. I first tried this a few years ago after Anna from Vivianna Does Makeup recommended it and I have not looked back sense. Every time there is the 40% off Make Up sale at priceline this is one of two products that I always stock up on. 9. Rimmel Stay Matte Pressed Powder - Translucent - This is the second product I always ALWAYS stock up on at Priceline sales. For its price it is such a great product I kid you not. I cannot even begin to tell you how many of these I have gone through. It is the perfect on-a-budget powder for setting make-up, giving a lovely matte finish without being cakey, minimising pores and just generally giving the skin a really smooth appearance. The only problem I have with this is the packaging, I absoultely hate the packaging but will put up with for the actual product. A lot of hits rather than misses this time round! 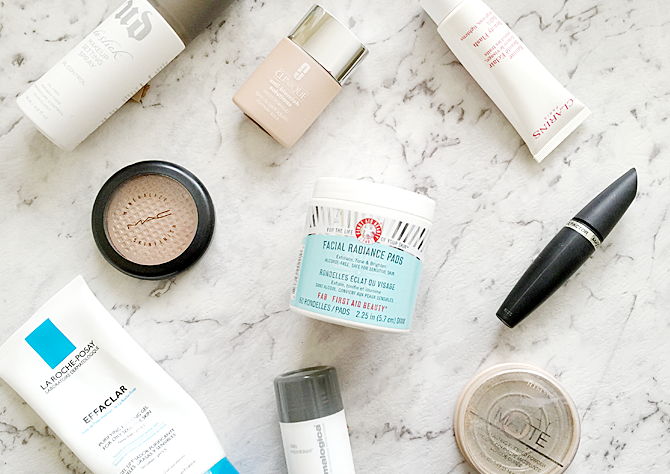 What empties do you have lying around? Have you tried any of these? I love the FAB Radiance Pads, I'm on my second tub, they are so gentle but really get the job done! Oh my goodness - you finishes an entire MAC MSF in under a year?!? How is that even possible?! Haha, good job gurl! I love the FAB radiance pads, I keep meaning to pick up another tub! I have just started using the UD De-Slick setting spray (and as another oily gal) I have been loving it! I really want to try that foundation! I really need to get the Urban Decay De-Slick Spray, it sounds amazing and just what my oily skin needs! October Favourites + I'm Back!